Diafaan SMS Server - light edition 2.1.5.0 - Download Win Apps. Diafaan SMS Server is a full-featured two-way SMS gateway for GSM and 3G modems..
Diafaan SMS Server is an easy to use tool to turn a GSM or 3G modem into a full-featured SMS gateway. It is designed for professional users, looking for an easy way to integrate two-way SMS into their IT system. 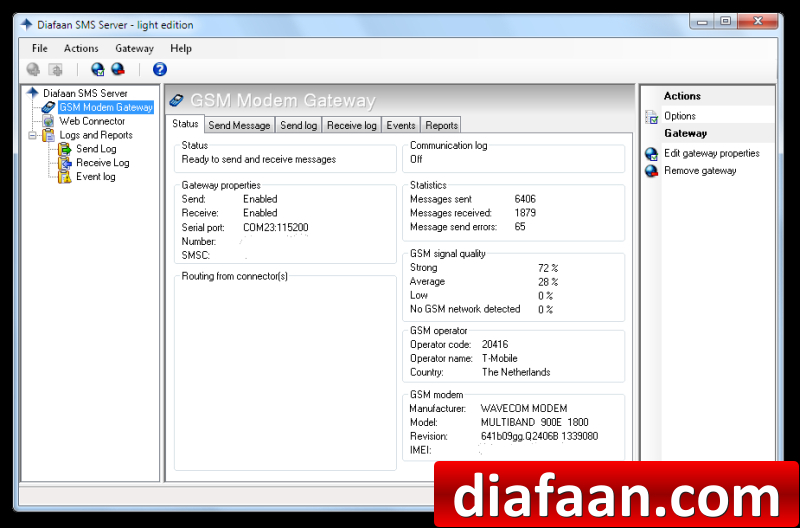 The light edition of Diafaan SMS Server supports one GSM modem or Clickatell account and one HTTP, Email, or SQL interface. It has a 30-day trial period and works without annoying ad messages or other limitations during the trial. Support for GSM/GPRS modems, SMPP and HTTP service providers and e-mail. Integrates with MS Access, MS SQL Server and MySQL. Use it for any scenario where SMS is involved, in any business case. Check out our case studies at http://www. activexperts.